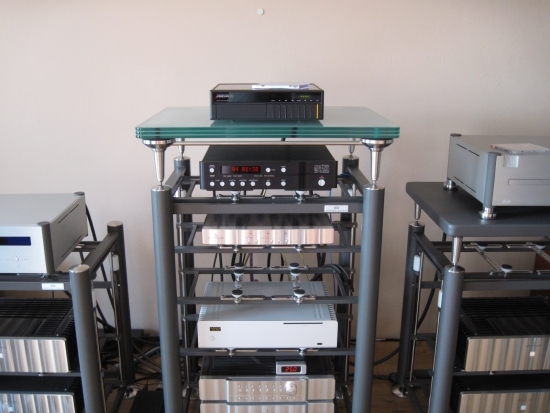 After I reviewed the Glass Turntable Platform in 2013, Artesania started work on a variety of new platforms made of different materials, as well as an extended range of dampers, of which the heaviest version is hardly movable! 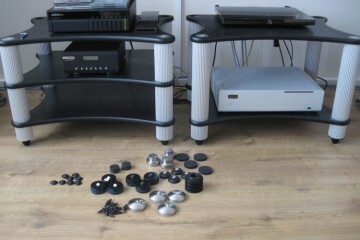 Because these platforms are actually meant to be used with Turntables, I will post this review in separate installments as I go along, starting with the effects with digital playback, then moving on to using them with various turntables. 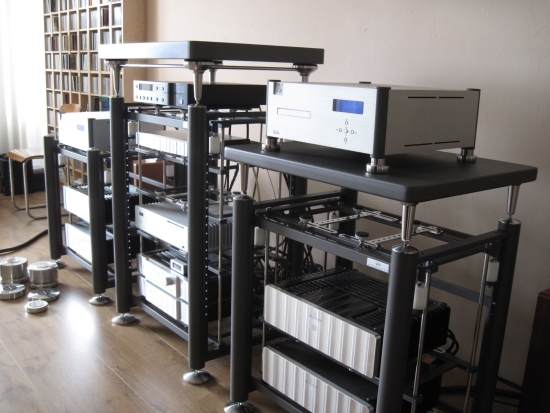 These Platforms are meant to be used with Artesania’s Exoteryc audio racks, as pictured above, but some of them can also be ordered as standalone floorstanding versions. The Krion Platform really is immacculately finished: silky smooth, and reassuringly dead when knocked on. It is largely made with natural minerals (ATH-Aluminium trihydride) and some high resistance resins. 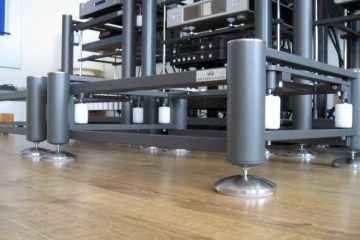 Like the Treated Glass Platform, the Krion Platform changes the sound of my system merely by being in place, without using equipment on it. That is, I did try “dampening” it (as if that were needed or possible) with a CD player, but that did not change the result. 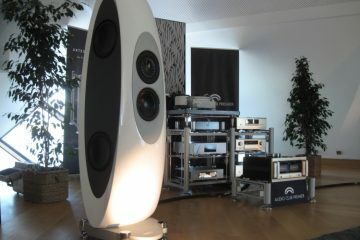 No matter if there’s equipment on top, with the platform in place, the sound becomes a little bit more boxy, as if the Apogees gain some coloration aspects of cabinet speakers. This is nothing to be alarmed about as it is an effect that any normal cabinet or wood rack would have. It’s just that my setup is entirely free from platforms and as such it becomes obvious as soon as one is added. And as mentioned in the earlier Glass Platform review, this is most likely also a function of my setup and the type and placement of the speakers. 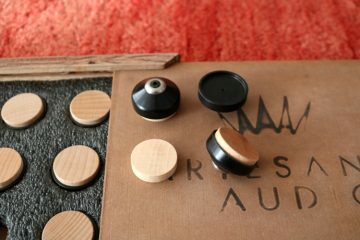 As a result of acoustic reflexions, I assume, the sound becomes more forward in the midrange which I don’t really like but at the same time the midrange aquires a nice sense of focus, which I actually don’t dislike. Leaving the influence of the Platform’s acoustical presence on the system aside, and using it as an actual platform for placing and using equipment on it turned out to be a pleasant surprise. Like any platform, board or shelf, the Krion is audibly recognisable for being a platform. 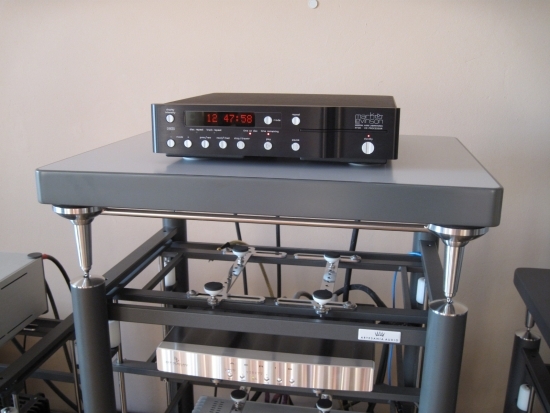 Compared to using the Levinson 390S CD player on the Artesania Exoteryc’s top level, the player sounds markedly different when used on top of the Krion platform: images are more outlined, a little bit contoured, and the sound is a bit more forceful. I don’t know how else to put it. People who have moved from a shelved rack to a rack without shelves will know what I’m talking about. Usually it is a matter of coloration and edge as a result of resonance build-up disappearing. 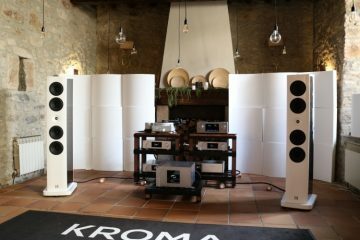 But in the case of the Krion, there is actually no coloration at all, the platform sounding as neutral as the rack itself. But maybe it does not sound as natural as the Exoteryc’s levels. 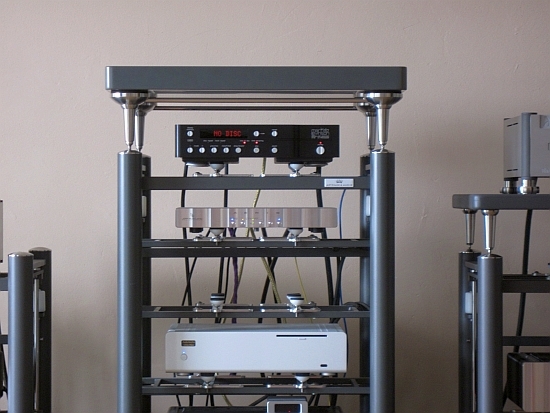 Such is the nature of a shelf-less rack, that any shelf, even the best ones, will sound different. 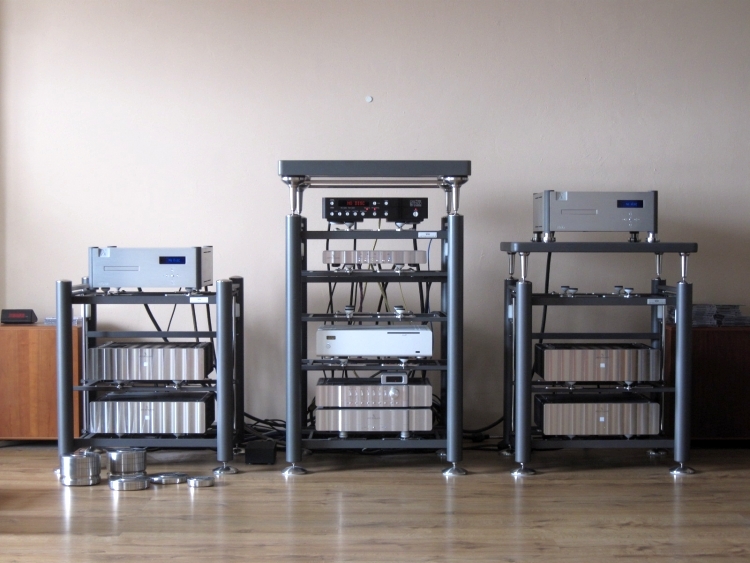 But make no mistake: I have used many racks and I can tell you that for a platform, the Krion really sets the standard, and it sets it very, very high. 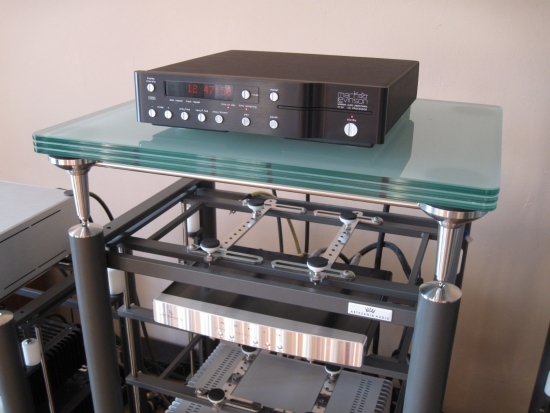 Like the Exteryc rack, it is superbly neutral, and in spite of the heavy damping, it doesn’t constrain rhythm, nor does it artificially speed up the pace. Its balance is just right. I can probably illustrate this better by comparing to the Treated Glass version. 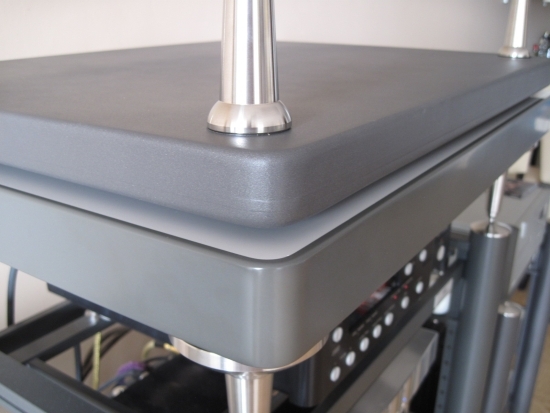 Above is the Digital Server Platform, placed on top of the Krion Platform. The former is less wide, less deep and less thick than the latter. The difference in class is clear from these pictures: the Krion has a flawless silky-smooth finish, while the MDF structure is visible on the Digital Server Platform. A note on the Krion finish: the surface may be silky smooth, but it isn’t scratch-resistant. After having placed the platform on its side on the laminate floor and replacing it a little later, I found noticed very light scratches on the edge. The platform is finished to the same high quality on all sides, so if it were to be damaged badly then there’s always the possibility to turn it upside down or front to back. 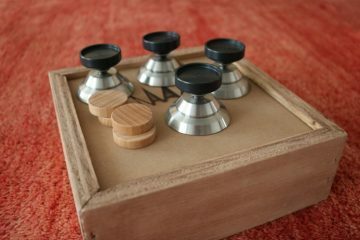 I will also test this platform with a selection of turntables. You can read all about that in part 2 of this review. 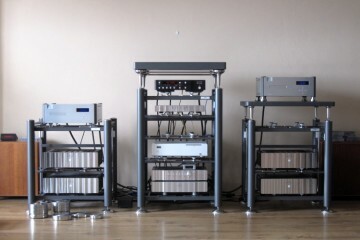 Like the Krion Platform, the Treated Glass Platform changes the sound of my system merely by being in place, and without using equipment on it. Its effect is a little bit more marked though and higher up in the frequency range than that of the Krion, and like with the Krion, its effect is both in the “welcome” and “less welcome” sense. The presence in the midrange is more pronounced, but the added focus is, too. The platform consists of three layers of glass with a bonding material inbetween. Forget about glass sounding edgy or ringing when knocked on: this platform is so very heavy and so well-damped that it will not ring at all. It sounds as dead as a material can be. There’s also no harshness or anything similar. Still, apparently there’s something to the material that prevents me from enjoying it. Using the glass platform with the Levinson 390S on top instantly took me back to the earlier review, and reminded me of why I didn’t like it. As mentioned, using the glass platform, music definitely isn’t edgy, or anything else that’s usually associated with using glass shelves. But here is a lot of added tightness, which can sometimes be a welcome effect, but in this case it is simply too much, making the sound overly controlled, mechanical almost, squeezing out the magic in the process. I feel like PCM now really sounds like the digital format that it is. Fluidity, and the sense of listening to real music is diminished and I find that I can only relate to the music on a cerebral level, not emotionally. By contrast, this is where the Krion Platform really proves its value: I can’t listen to the glass platform without starting to feel uncomfortable after a few minutes, but the Krion relaxes me just like using the Exoteryc levels does, and even though it is well-damped, it maintains dynamic contrasts and still makes my feet tap. 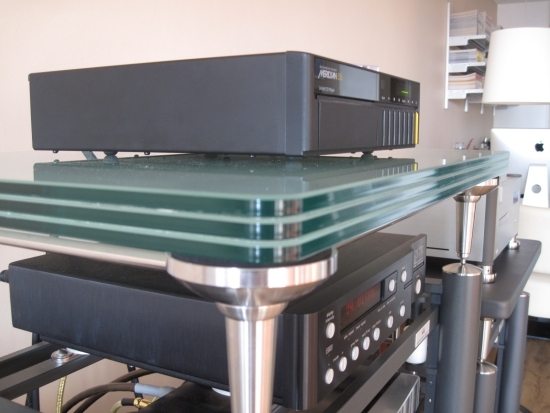 Nevertheless, I will again try the Treated Glass Platform in the next round, using what it was meant to be used with: a turntable. 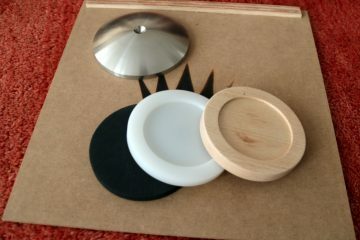 And I won’t stop at one turntable: I will actually try several models. I also placed the Krion Platform on the right hand rack, just to see what would happen. As it turns out, in that position (still only placed into position and not used as actual shelf for playing equipment) it still excites the midrange prominence described above, but in a highly diminished manner. Its presence is still detectable, but definitely less so. I suspect that if the platforms are used anywhere else but between the speakers, they would likely have even less of an influence on the sound, perhaps even rendering this issue non-existent. After all I also have tables, chairs, wall shelves and such. I just don’t have them inbetween the speakers. 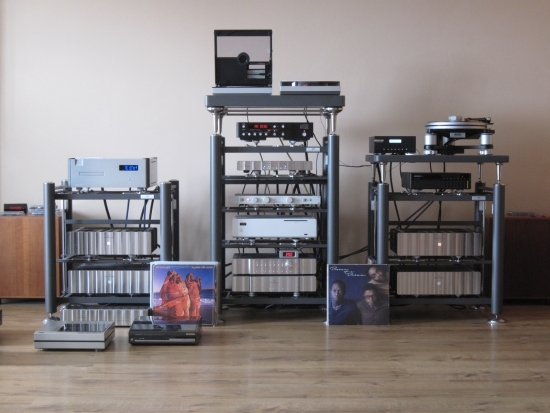 The point that I’m trying to make is that your mileage may vary if you have the racks set up on either side wall, or use cabinet speakers, i.e. not dipoles like me.